This is the home of music producer and pianist Christopher Dominique. Artist Dolly Dolores and Swedish Childrens music star Doreen Månsson. We produce and record music in Tambourine Studios in Malmö, Sweden and our own rehearsal/recording studio Tongue and Groove set in the countryside in the village of Hurva north of Lund in Sweden. We also do concert productions for events and crossover concerts with Artists and symphony orchestras. 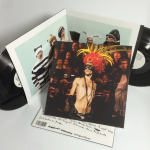 #bobhundopera is available as a double LP on vinyl in the Bob Hund webshop. Recorded live at Malmö Opera 2014 with arrangements and Piano by Christopher Dominique. Mighty Terror Album available on Spotify!